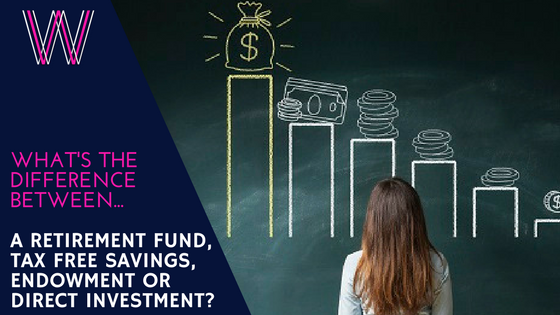 Retirement Funds, Tax Free Savings, Endowments or Straight Unit Trusts… What’s the difference? It never fails to amaze me how complicated this world of investing is – or seems – to normal everyday humans. The challenge with so much choice is that it ends up paralysing us. With over a 1000 local funds and a gajillion offshore ones – it’s a no wonder we just roll over and go back to sleep. Then in addition to that, you’re then asked whether it needs to be in a Retirement Fund, or Tax Free Savings account or just a straight unit trust or mutual fund… and we all just want to dig a hole and hide. The good news is that there’s a simple analogy to help you understand all the different options. Think of a chocolate at Easter or Christmas time. The same round ball of yummy is then wrapped in a green shiny foil, a red one or a gold one. The difference between them is how they are taxed. That’s all. It’s a big difference. And can mean thousands of Rand or Dollars in the end. So it’s a difference you need to understand. The chocolate egg is your unit trust fund. Let’s say a Balanced Fund Tracker. We spoke a lot about how you choose that fund both in the podcasts and in the blog. The first step is to choose what fund you want. The wrapper is the tax treatment of it and other characteristics. And each of those tax rules are given a name – either a Retirement Fund (401l or IRA), or a Tax Free Savings Account (Roth IRA), Endowment or a plain unit trust (mutual fund). The first set of tax rules is the way the money goes into the fund. This is either pre income tax or after income tax. The only type of fund that allows your income to go straight into it without income tax is the Retirement Annuity. In the US this is called a 401k or IRA. All the other options are after income tax. That is to say that your income tax is first deducted, and then you can invest it. This makes a big difference over time, as it means that you get to earn interest and dividends off the tax portion of your money. For employees, it’s easy. The company first pays your money into the employee fund, and then what’s left over, the government taxes. So you pay less tax. For self-employed or those that put extra contributions aside, you claim back the monthly contributions in your tax return. This usually results in you paying less tax or getting a refund. The next difference is on limitations in terms of how much you can put into the fund. For both Retirement Funds or Tax Free Savings Accounts, there are limits. Retirement Funds apply the pre-tax funds to R350,000 maximum or 27.5% of your salary. Tax Free Savings Accounts limit you to R33,000 per year and a lifetime maximum of R500,000. Retirement funds have restrictions on what you can invest in. They limit you to a maximum of 30% offshore, an additional 10% in Africa, and a minimum of 60% in South Africa. There is also a limit in terms of how much can be in shares / equities of XXXX. This is called Regulation 28. When you put together the different unit trusts or mutual funds, a check is then done to make sure that the combination of them doesn’t breach the limits. Please note that the name Tax Free Savings Account is a misnomer. This is NOT restricted to a bank savings account, and in fact is best used for investments. (see below). We invest to earn more ‘free’ money. That’s dividends, interest and growth of the money we invested, or capital. Unfortuneately each of those attract tax. Dividend Tax, Interest Income Tax and Capital Gains Tax respectively. At the time of writing (2018), you pay 20% on Dividend Tax, up to 45% on Interest Income Tax, and a maximum of 18% on Capital Gains Tax. So, this can have a significant impact over time. If you don’t have to pay those taxes, all that income and growth can keep generating more income and growth as you go. Retirement Annuities and Tax Free savings Accounts have no tax whilst investing in them. No Dividends Tax, No Interest Income Tax, and no capital Gains Tax if you move your investments from one fund to another, or from shares to savings. Endowments income get taxed at a straight 30%. So if you’re paying over 30% in income tax, it’s a savings for your Interest Income. There is no Capital Gains Tax (CGT). Normal investments, or what’s called Discretionary Investments, attract all three. The last tax difference is on when you draw out your money. And this is a major difference. When you draw money out of your Retirement funds you pay income tax. And this is very important to remember. That retirement fund is actually able to buy you less than the R1m you have there because you need to pay tax first. The Tax Free Savings Account and Endowment pay nothing on withdrawal. No income tax, no CGT. Discretionary funds pay Capital Gains Tax on withdrawal. Lastly, each of these work for different time horizon’s. Retirement Annuity and TFSA’s are designed to be long term investments. The TFSA should be at least 15 years or more. The endowment is for a minimum period of 5 years. And the discretionary investment is for you to choose. You can keep it for a short term or a long term. Want our free How to Invest PDF?